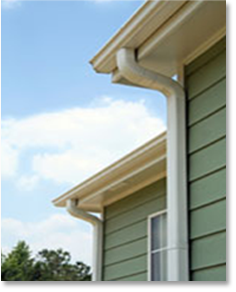 Good rain gutters can be essential for the protection of eaves, fascia, siding, basements and crawl spaces, they allow you to control and channel rain and snow run-off to a desired location. If the current gutter system on your home is outdated or damaged by a storm it may be time to consider replacing them. At Quality Construction we have many affordable options to suit your individual needs. There are numerous gutter materials to choose from, vinyl, copper, steel, and aluminum, are just a few. Many people are initially tempted by the "interlocking" gutter systems that are purchased at larger chain stores. These tend to create many problems for the home owner. Interlocking systems are sold in 10 ft. sections that use couplers for each connection and each corner, this creates dozens of potential problems that could cause leaking in the future. After a few years in the sun vinyl gutters get brittle and break easily, especially during hail and wind storms. If you are experiencing problems with your interlocking gutter system it may be time to look at replacing them. Call Quality Construction today and one of our well trained representatives will come out and provide you with an estimate free of charge! The seamless gutter system is well worth considering for the installation of your new gutters. All seamless gutters are fabricated on site to fit your particular home needs. The improved performance of your gutter system is well worth the additional investment. Quality Construction, Inc. can provide you with all your guttering needs. Whether it's commercial or residential we have the experienced craftsman that will get the job done right. Our gutters will add beauty and value to your property and provide you with years of worry free operation. Just give us a call or fill out the contact form on the top right to find out how we can help you. We also have many gutter covering options that will help you save time and money. No more gutter clogs or cleanings!! Quality Construction, Inc. offers four main styles of gutters; 5” O.Gee or “K” style, 6” O.Gee or “K” style, "Fascia" style, and "Half Round" Style gutters. 5” “K” Style gutters are for most residential applications. 6” “K” Style gutters are for larger homes and commercial applications. Fascia style gutters for new homes, or to cover the fascia and omit painting in the future. The color selection shown applies to aluminum or steel rain gutters. All these paint colors contain Dura Coat XT-10 with TEFLON® surface protector to resist staining. Lifetime Finish Warranty. So whether you are in need of replacing your storm damaged gutters, or you are looking for a custom upgrade Quality Construction has a suitable option for you. Call today and schedule your free consultation!! We also have many financing options available. Call for details!